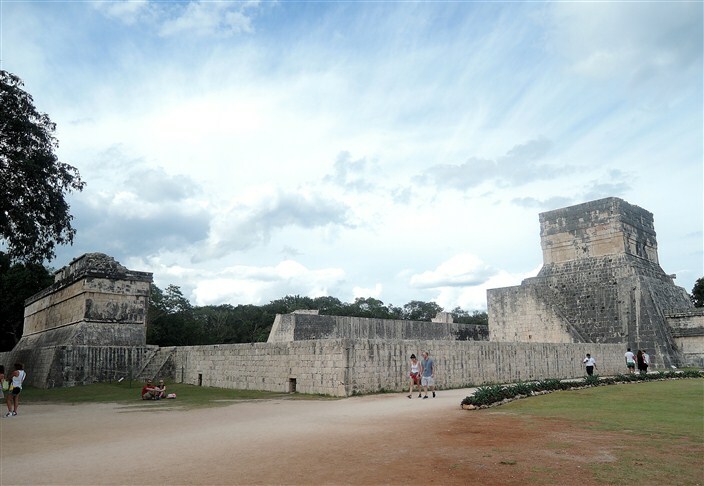 Among the premier attractions when visiting Cancun are the world-famous Mayan ruins at Chichen Itza. 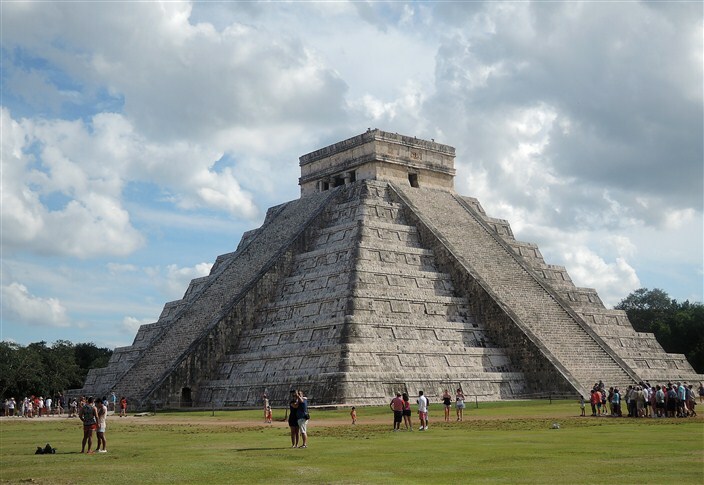 In 2007, Chichen Itza was voted one of the New Seven Wonders of the World in a worldwide vote. 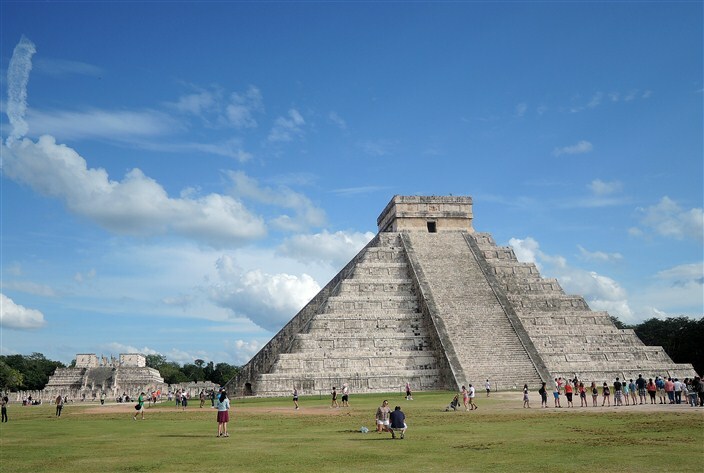 Chichen Itza is also a UNESCO World Heritage Site, and is the second-most visited of Mexico’s archaeological sites, receiving approximately 1.4 million visitors per year. The site is about a two and a half hour bus ride from the Cancun hotel zone. It’s easy enough, and not terribly expensive, to book your tour through your hotel. We did it this way and paid around $80 U.S. apiece. This includes both pickup and return at your hotel main entrance, a very comfortable, modern air-conditioned bus, an extremely knowledgeable all day tour guide, admission to the site, and an extensive all-you-can-eat buffet-style lunch. Also, our excursion included stopovers at an authentic Mayan village (featuring a massive tourist/souvenir shop selling “authentic” Mayan jewelry and other assorted dust-collectors), a drive-through of the Spanish colonial city of Valladolid, and the opportunity to jump into and swim around one of the underground cenotes (large, freshwater basins hollowed out of the limestone bedrock over the centuries by erosion) found throughout the Yucatan Peninsula. 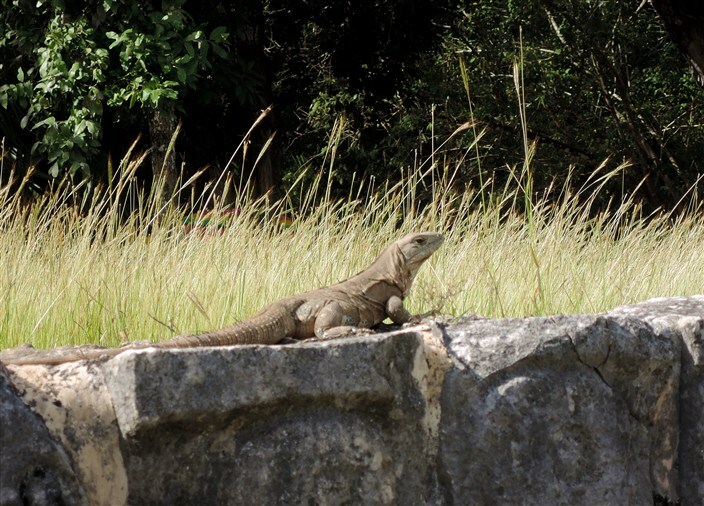 Of course you can find cheaper cut-rate tours out on the streets of Cancun, but buyer beware on these. You’ll have to find your own way to a designated starting point and same on return, and most of these do not include the extra stops, lunch, the air-conditioned bus or perhaps even a guide who speaks understandable English. At any rate, we were quite satisfied with our tour and felt we got more than our money’s worth. The day began early. We had to be at our hotel entrance for our bus pickup by 6:30 a.m. After checking in and driving a few miles to a transfer terminal, we began the long main leg of the journey. 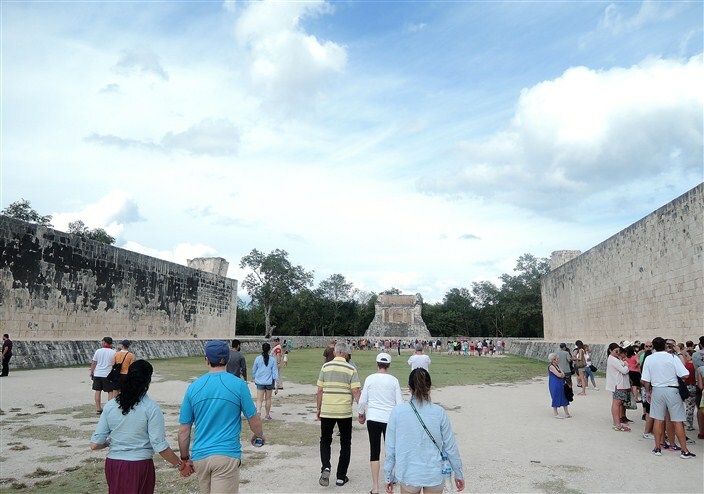 Chichen Itza is located in the interior of the Yucatan Peninsula far from the coast, and to be honest, there isn’t a whole lot to see on the way. The Yucatan is a limestone plateau, flat and covered in low, scrubby trees. Interesting fact: there is no surface water on the entire Yucatan peninsula. No rivers, streams, lakes, nada. 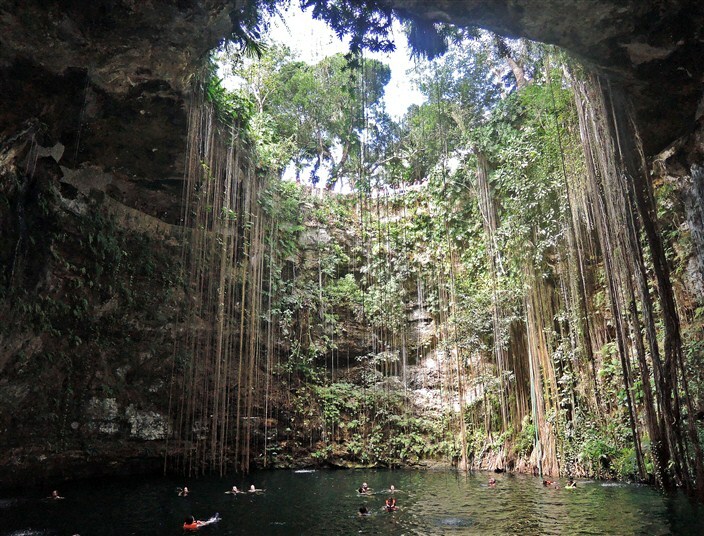 All the fresh water is found in the previously mentioned cenotes where the rain and ground water has collected over the centuries. 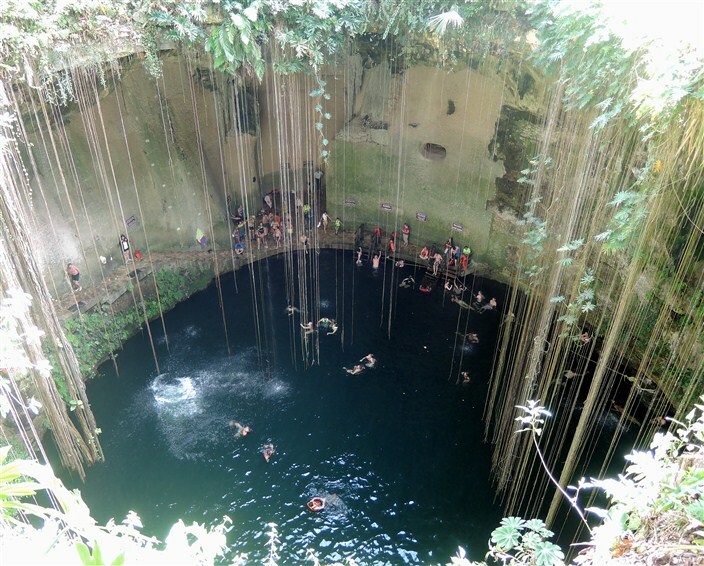 This was important to us not just as a local geographic fact of note, but also because one of the coolest parts of our day was a stop at one of these cenotes. 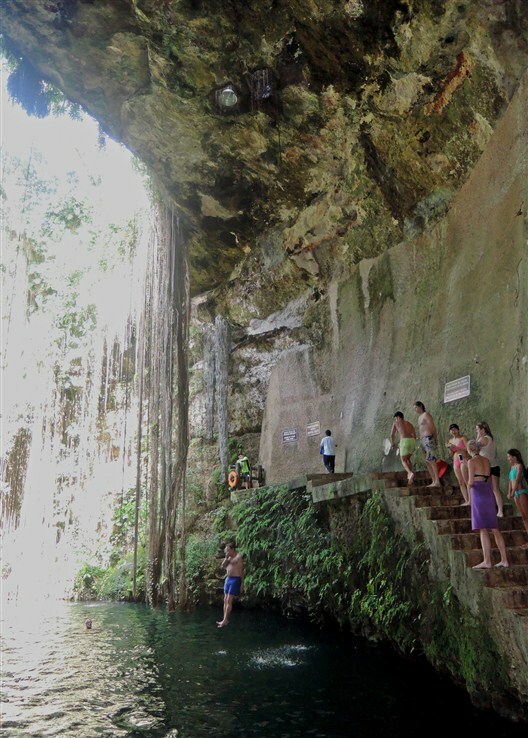 After ducking in the bathhouse and changing into my swimming trunks, I headed down the stone stairway along with a few dozen other folks for a refreshing dip into the clear, cool waters. This is accomplished in any of several ways. You can descend into the water via a short stepladder, jump or dive a couple of feet from the main platform area, or walk up a series of steps and jump/dive from any height you choose, up to about a twenty foot drop. I jumped in from varying heights and it was a blast every time. The water is very deep so there’s zero chance of hitting bottom, and a perfect temperature, cool and refreshing but not too cold. After swimming we had an excellent lunch on the grounds, then filed back onto the bus for the final leg to Chichen Itza itself. Upon arrival we disembarked and assembled with the other members of our tour to wade through the mosh pit of the massed throngs of people all funneling through the entryway. This took some time. It’s a popular place and, to my Americanized eyes, not that well organized. Once we’d gotten inside, we followed our tour guide (the same fellow who was also our host/guide on the bus) as he led us around the grounds and explained everything. And here I’d like to say some kind words about this man, Jesus. 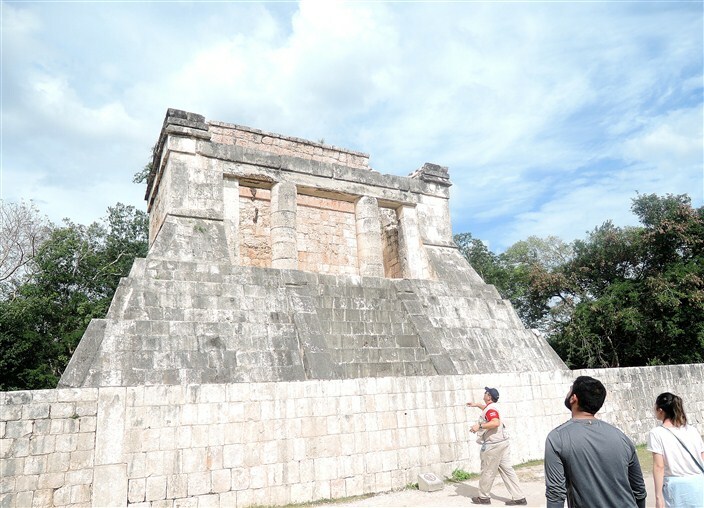 Yes, that’s right, we were followers of Jesus at Chichen Itza. We felt he was a model of professionalism throughout the day, whether on the bus or any of our several stops along the way. His English was faultless as he transitioned between two languages while imparting information to us as we drove. He struck the perfect balance of entertainment, information and leadership needed to herd a diverse group of people around all day. One of his best jokes was when he introduced our bus driver early on, whose name was Angel. 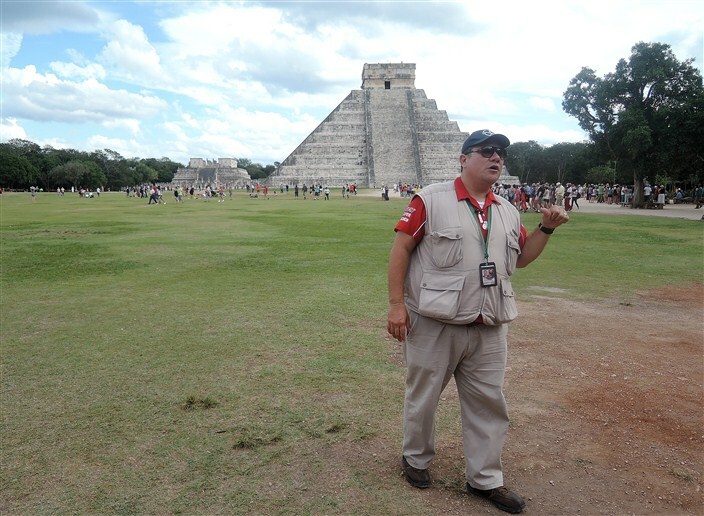 Overall, I have to say I have a very mixed opinion about our time at Chichen Itza. 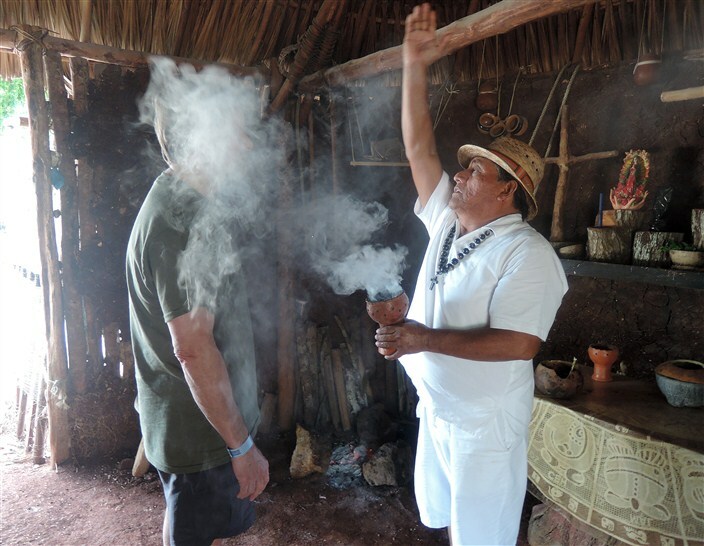 The place itself is fabulous to behold, the architecture is amazing and the history of the Mayan peoples of the region is all fascinating. But…a lot of it is ruined by the ubiquitous and omnipresent vendors. I was quite shocked to find them allowed to set up and sell their cheap crap inside the park itself, right on the grounds. The walkway from the entrance out to the main complex is lined on both sides with them, like running an actual gauntlet. They do just about anything short of tackling you to try and get you hooked into buying something. We found it disconcerting to say the least. Here you are in a unique natural setting surrounded by the remnants of one of the world’s great ancient civilizations, a place that exudes a palpable aura of a magical, mystical, lost world, and all you can hear wherever you go is the incessant chatter of vendors hawking their cheapo souvenirs for “onlyonedollaronlyonedollaronlyonedollar” repeated ad nauseum like some religious mantra. For me, it pretty much ruined whatever atmosphere the park might have had without their presence. I could understand if they were allowed to set up and sell their junk outside the park. It’s a poor country, they’re only trying to make a living, I get it. But once I’ve paid my money and entered the actual park grounds, I expected some semblance of, I don’t know…respect for their own culture and history? It would be like visiting Yellowstone and walking out to Old Faithful and finding it surrounded by row after row of aggressive vendors hawking t-shirts and postcards and cheesy knick-knacks to take home for Granny and Aunt Ethel and the cousins. Maybe I’m just a spoiled gringo tourist, but I say keep it in the souvenir shops where it belongs. 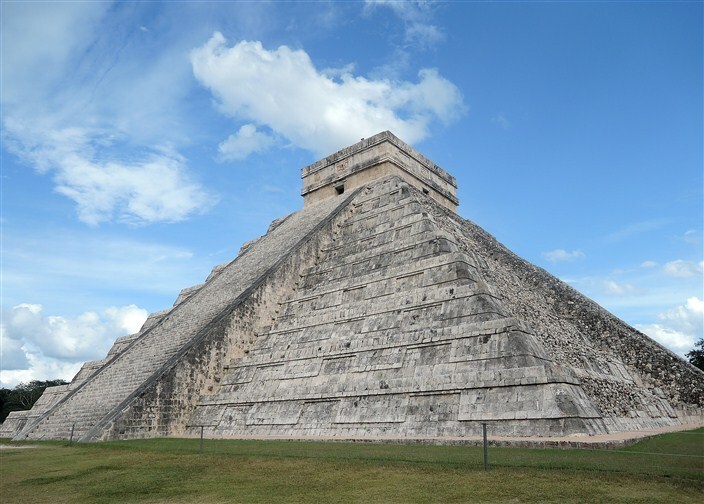 The centerpiece of Chichen Itza is El Castillo, aka the temple of Kukulcan, the famous pyramid which dominates the complex. 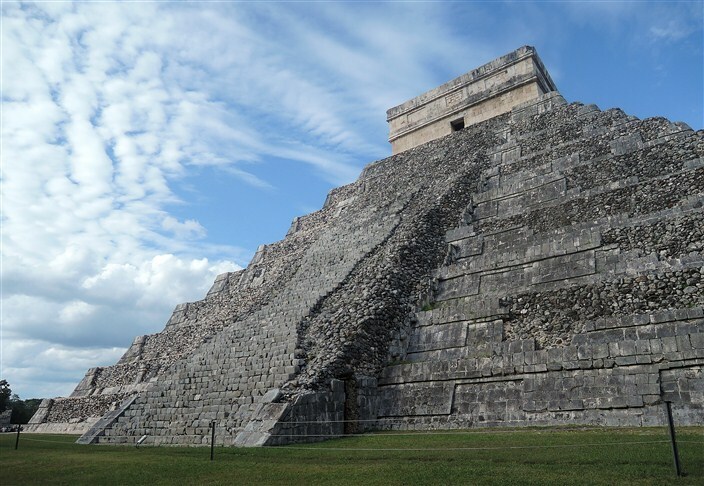 Though not as tall or massive as the pyramids of Egypt, El Castillo is renowned for other reasons, primarily the precision of its architecture and the religious and scientific qualities built into this design. The pyramid stands about 30 meters (98 ft) high and consists of a series of nine square terraces, each approximately 2.57 meters (8.4 ft) high, with a 6-meter (20 ft) high temple upon the summit. No climbing to the top, however. This once common practice was stopped in 2006 after a woman fell to her death. In addition to the danger posed to tourists, authorities were also concerned about potential damage to the edifice itself. 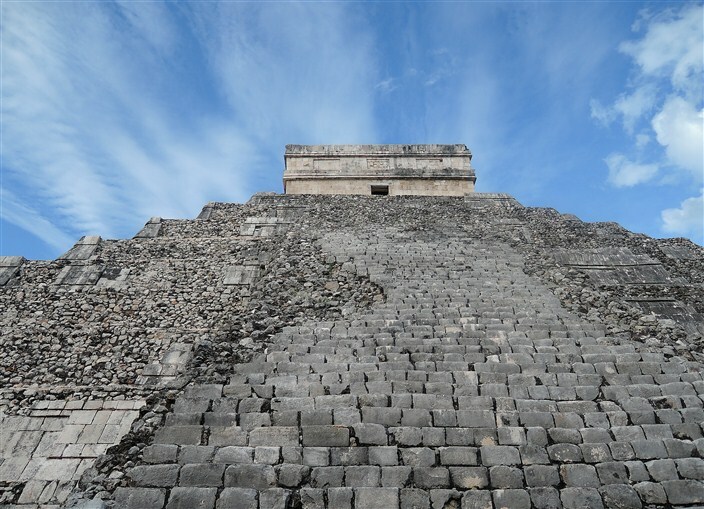 One of the unique features of El Castillo occurs during the Spring and Autumn equinoxes. 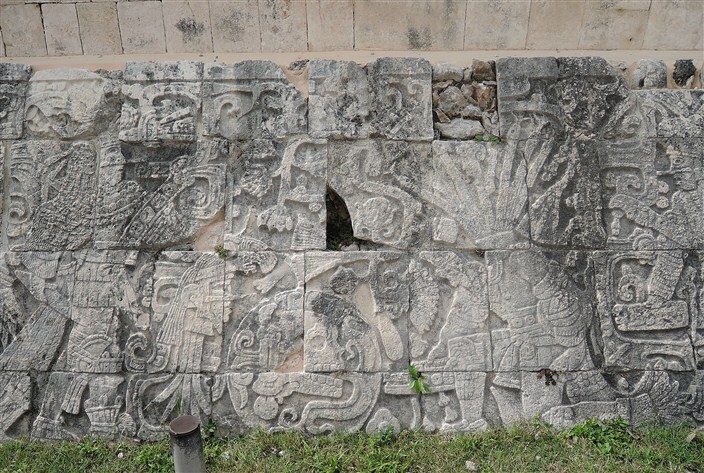 In the late afternoon, the northwest corner of the pyramid casts a series of triangular shadows against the western balustrade on the north side that evokes the appearance of a serpent wriggling down the staircase, which some scholars see as a representation of the feathered-serpent god Kukulkan. Another of the impressive sites on the grounds is the Great Ball Court. 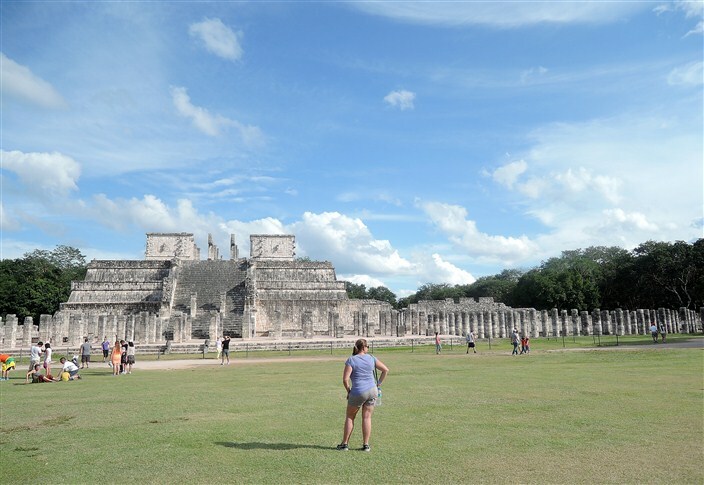 Archaeologists have identified thirteen ballcourts for playing the Mesoamerican ballgame in Chichen Itza, but the Great Ball Court is by far the most impressive, largest and best preserved ball court in ancient Mesoamerica, measuring a massive 168 by 70 meters (551 by 230 ft). The parallel platforms flanking the main playing area are each 95 meters (312 ft) long. The walls of these platforms stand 8 meters (26 ft) high. Set high up in the centre of each of these walls are rings carved with intertwined feathered serpents through which the participants tried to pass a ball. The ball was made of solid rubber and could weigh up to nine pounds. At the base of the high interior walls are slanted benches with sculpted panels of teams of ball players. In one panel, one of the players has been decapitated and the wound emits streams of blood in the form of wriggling snakes. I guess you really didn’t want to be on the losing side. As with everything in the Mayan culture, these games were intertwined with and formed an integral part of their religion, which ruled every single aspect of their lives in ways unimaginable to us in the modern era. People complain nowadays that sport is taken too seriously, but these ball games were not just sport, but rather ritual games filled with religious symbolism and pageantry and often ending in human sacrifice. The Mayans were big on human sacrifice, and practiced constant warfare among their various tribes. This was one of many factors including famine, drought and disease which ultimately led to the disintegration and demise of the Mayan civilization. 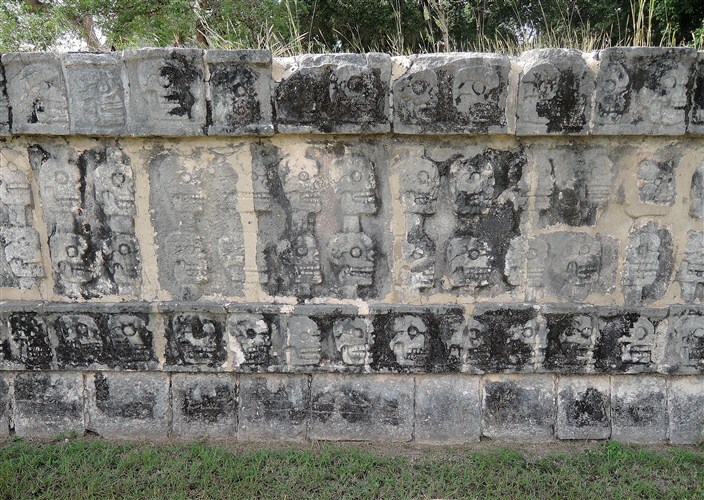 One commonly held misconception is that the Spanish wiped them out, but in fact by the time the conquistadors arrived, the great Mayan cities had declined and been mostly abandoned for a couple of centuries. 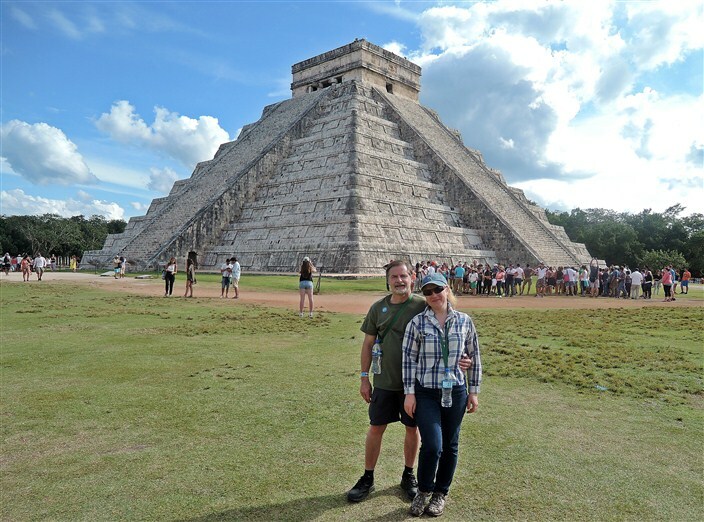 Caveats about the vendors aside, dont let that dissuade you from visiting Chichen Itza if you are ever in the general Cancun/Yucatan area of Mexico. Go check it out and decide for yourself. It is an amazing place to experience.